The Santa Fe Opera House is a uniquely situated opera organization in the New Mexico desert. 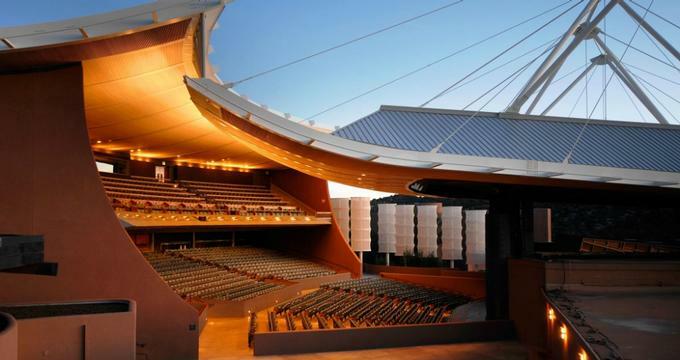 Its open-air opera house in Santa Fe with superior acoustics has won several design awards. The 155-acre campus is also home to a three-story orchestra hall. The Ranch provides housing to musicians and singers, allowing them to learn new roles and perform without the usual pressures of opera in the big city. The Crosby Theater offers panoramic views of the Jemez and Sangre de Cristo Mountains. Originally built in 1957, it has since expanded its seating capacity from 480 to over 2,000. Each seat and standing position offers a clear view to a digital opera titles screen, which translates the operas to English. A curved roof of over 25,000 square feet has been designed to reflect the sounds of the stage to the audience, and doubles as a rain-water collector, annually capturing 60,000 gallons, which are used to maintain the opera grounds. The Stieren Orchestra Hall was built in 2001 with a donation from opera supporters Mr. and Mrs. Arthur Stieren. The building offers over 12,000 square feet of studio space for orchestra rehearsals, as well as private rehearsal studios for singers, and climate-controlled storage for the opera’s costumes. With an expansive campus and ample parking on the mesa above the theater, opera attendees enjoy an evening under the stars, and may attend a preview dinner before each show, order a luxury picnic, or bring their own picnics for tailgating in the parking area up to three hours prior to each performance. History: The Santa Fe Opera was founded by visionary John O. Crosby as a gathering of musical luminaries in the early 1950’s. Crosby’s vision included the operation of a rustic guest ranch to which musicians and signers were invited to spend time learning from one another. In 1956, with an investment from his parents, Crosby was at last able to build an open-air theater, and legend has it that he and acoustician Jack Purcell drove through the desert firing guns from their Jeep to find the most suitable sonic location in which to construct the amphitheater. After the original opera house was damaged by fire in 1967, the architectural firm of James Stewart Polshek and Partners designed the present day theater, with assistance from acousticians Purcell & Noppe & Associates. The opera house has been referred to as a ‘miracle in the desert’ and its achievement in design has been lauded over the years by Time Magazine, the New Yorker, the Washington Post and the Wall Street Journal among others. Ongoing Programs and Education: The Stieren Orchestra Hall is home to the opera’s Prelude Talks as well as guest lecturers, special events, and recitals. Prelude Talks take place before the opera’s performances and invite guest speakers to engage the audience with additional information about the evening’s performance. In keeping with Crosby’s original vision, the opera offers an Apprentice Program for singers. The internationally acclaimed program accepts 40 singers annually from a competitive pool of applicants. An Apprentice Program for Theater Technicians has been operating since 1965. The program offers technicians instruction in production design, lighting, audio and video, make up and costuming. Visits to the opera may be enhanced with one-hour backstage tours, or tours of the opera’s ranch. Ranch tours meet the last Friday of each month, and include a Meet the Artist presentation with one of the resident apprentice singers. Opera Insider Days take place on Saturdays throughout the summer and incorporate a light breakfast with an insider’s look at the opera, a backstage tour, and a scavenger hunt for children. The opera runs an extensive array of programming for youth and the community. Youth programs include summer camps, youth nights at the opera, and high school mastery programs for students interested in opera production and technical theater. The Pueblo Opera Program, or POP, has been ongoing since 1973 and introduces over 1,000 Native American children from New Mexico’s pueblos and reservations to operatic performances. Opera for All Voices is a consortium that commissions works of opera from up and coming artists who desire to make opera more accessible and affordable for all. Past and Future Exhibits: The 2018 opera season begins in June with Madame Butterfly. Additional 2018 performances will include Candide, Doctor Atomic, The Italian Girl in Algiers, and Ariadne auf Naxos. The season concludes in August.